Against all odds, not only has Coco survived parvo, she has now come through thoracic surgery for Persistent Right Aortic Arch. All of us at GSDR would like to express our gratitude to all those people that contributed to the Coco fund which helped raise a staggering total (including Gift Aid) of £10,027.30. Coco will get all the treatment she now needs. Thank you to all Coco's supporters, we couldn't have done it without you. Coco's dream has come true, she survived parvo and her thoracic surgery and is now helping us to raise funds to help other needy dogs like herself. Huge thanks to her lovely foster dads Will and Wayne who took great care of Coco when she was so poorly and need lots of TLC and nursing back to health. 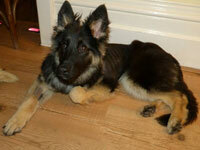 Coco is very lucky to have been adopted by Ann and Andy, two GSDR volunteers. 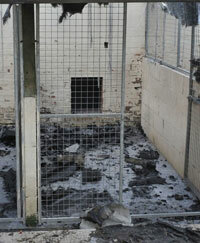 How could so many dogs have been suffocated by smoke or burned alive when this dog rescue centre was targeted by an arsonist? As the story unfolded, something didn't ring true. How could so many dogs be locked in their prison cells, yet no member of staff was on hand to sound the alarm in the event of an emergency? Why were no alarms fitted? We all know that you only have to burn a slice of toast and the smoke detector goes crazy. If they were fitted, then clearly there was nobody there to hear them. 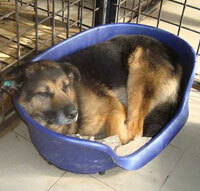 This is the story of King, an 11-year-old GSD that was an emergency rescue on Friday 8th February 2013. Julie Wilkinson and Angela Hargreaves of GSDR pulled out all the stops and got him out of the pound in the nick of time - literally hours before he was due to be put to sleep. King was microchipped but when the pound contacted his owners, they didn't want him back because they now have a puppy! King went into foster with a volunteer Angie Vaughan, who cared for him for the rest of his days. Polly A GSD That Came For A Reason. 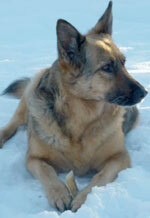 The following story is about my German Shepherd girl, Polly. In part it's sad, but really it's a story of hope. It’s a story that proves that these bewildered, often misunderstood, abandoned and mistreated dogs can be transformed into the wonderful, loving, loyal companions they were always meant to be. Let's not forget that this dog was thrown into the pound at the point of euthanasia. Polly was an innocent, her previous issues weren't her own as they were man made by disgusting people not worthy of her. In memory of Polly Watson, a beautiful dog and desperately missed. Smiley is a mixed German Shepherd who came to GSDR when he was 7-8 years old, saved from the streets of Bucharest and from the slaughter that is occurring out there in Romania right now. Smiley was rehomed where things became very bad for him in an awful home that didn't treat him nicely. Smiley has now been in kennels since January 2014 with no interest in him whatsoever. Smiley was a lovely, friendly, affectionate boy but when he first arrived but he was a different dog when returned and now hates children. Smiley has learnt to trust some big people again and one of the dog walkers takes him home for the day to get him out of kennels. You really would have to have a heart of stone not to be moved by this poor boys story. The cruelty inflicted here on one of our 4 legged friends by human beings, beggars belief. When Amil (which means Hope) was found, his jaw had been tightly wired shut and caused serious injury to his nose. He is around 3 years old yet in his short life, he has only known cruelty and abuse at the hands of humans - until going into rescue. JETHRO - OLDER GSD RESCUED FROM HELL! We hope someone will like him and take him out of kennels into a home sooner rather than later as he is an old boy with a harsh past. Although he spent many years in the terrible Public Shelter in Romania in a 1m square cage, he hasn't lost any of his zest for life and has many things to give, like love and lots of fun! 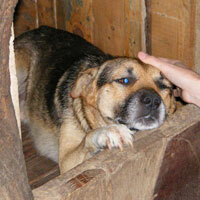 He certainly won the hearts of his rescuers in Romania. 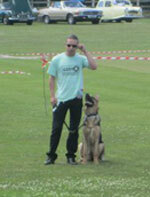 This lovely boy Jethro is one of the lucky ones, not all dogs have such good fortune. 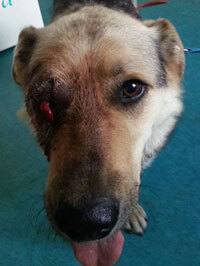 Bebe - Romanian GSD who was beaten and kicked. 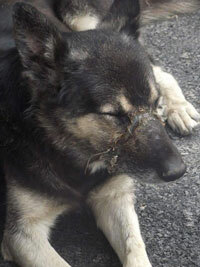 This poor dog has not had a good life but things are changing for Bebe and he is coming to the UK. 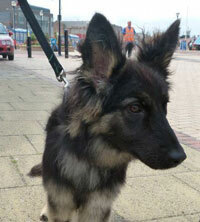 We urgently need to find a foster home for Bebe otherwise, he will have to go into kennels. Despite the beatings and kicking, Bebe has learnt to trust humans again, he has a lovely temperament and will prove to be a very loyal and loving companion. Here is a little bit about Bebe's history, it is not an easy read. Bebe found himself a lovely home here in the UK where he is much loved and cared for. 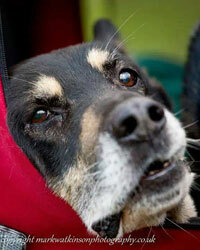 Karla came into the rescue in March 2011 aged approximately 4 months. She had spent her short life, tied to a washing line. She was adopted by Mark Steward a volunteer for GSDR who initially offered to foster Karla but couldn't bear to let her go. Mark and Karla started to attend a dog training school around May, which she loves and has passed her Puppy, Bronze and Silver Good Citizen Dog Scheme which is accredited by The Kennel Club.